From the 30th of March to the 7th of July, in the stunning framework of Palazzo Ducale of Genoa, discover the fascinating artworks by Giorgio De Chirico treasured in the exhibition “Giorgio De Chirico. The face of Metaphysics”, arranged by Victoria Noel-Johnson. Twenty-five years after the last art show dedicated to the famous artist, this extraordinary exhibition sets its main purpose in pulling people closer to the philosophical meaning of his masterpieces. The review contains about one hundred artworks that point out the whole evolutionary process which characterized the entire art-career of the painter, clearly affected by Nietzsche’s philosophy. 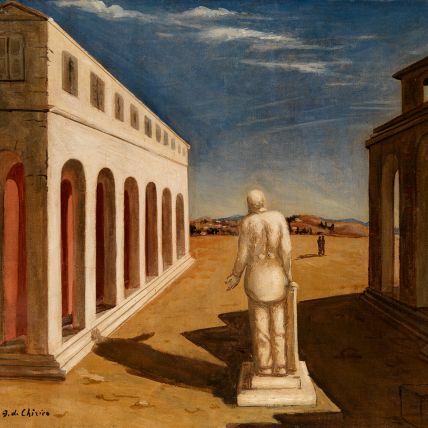 Moving step by step through De Chirico’s art-path, the spectator will notice his commitment in finding a way to offer to the audience a concrete vision of the metaphysical philosophy and its intangible concepts. The metaphysical insides; the still-lives; and lastly, the tradition, inspired by Rubens’ and Velàzquez’ portraits and by the re-interpretation of famous artworks by Durer, Watteau, Courbet, Renoir, Raffaello e Perugino. from Tuesday to Sunday from 10:00 am to 7:30 pm.